Completing a triathlon is a lifetime achievement for many, but for Cazenovia College cross country and swimming and diving head coach Bill Houser, it's merely a warm-up. Coach Houser has competed in over twenty triathlons since 2006 including two Full Ironman, five Half Ironman and several Olympic and Sprint Distance Triathlons. 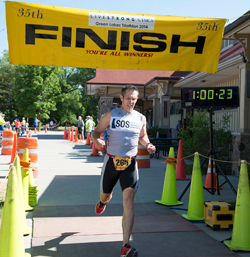 On Saturday, June 7, Houser returned to the site of his very first triathlon – the Green Lakes Triathlon at Green Lakes State Park near Fayetteville, NY – and claimed first place out of over 340 participants. Read the full story on the Wildcats Athletics website.